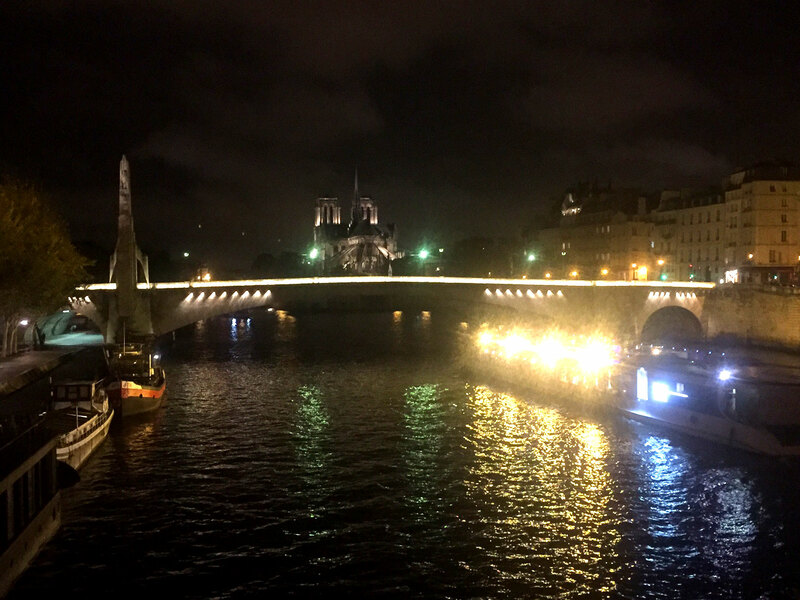 One of the perks of traveling to Paris on business is the opportunity to add a few days to our trip for pleasure. 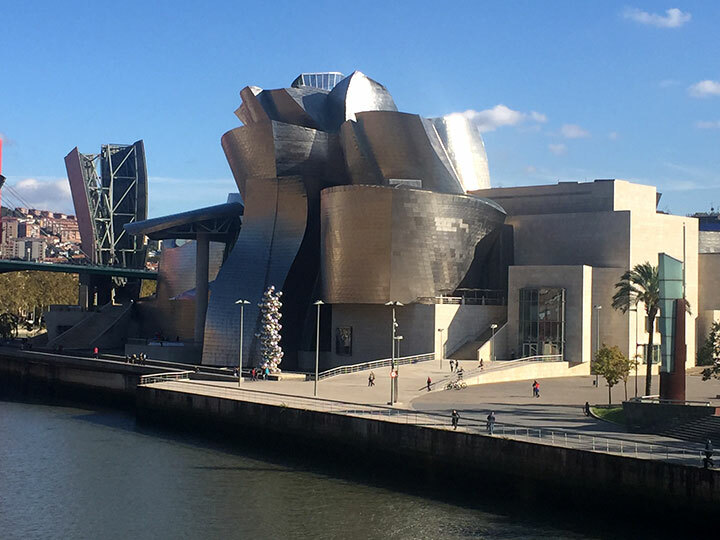 This time we decided to visit Biarritz, France and Bilbao, Spain, home of the Frank Gehry-designed Guggenheim Museum. Ever since I saw photos of the building, opened in 1997, it’s been on my bucket list. I wasn’t disappointed, just surprised. First I was surprised that the museum is right in the center of town. I had visions of it being on the outskirts, on its own campus. I also thought it was larger. Mind you, it wasn’t small, just smaller than I had imagined. Regardless, it is spectacular architecture. 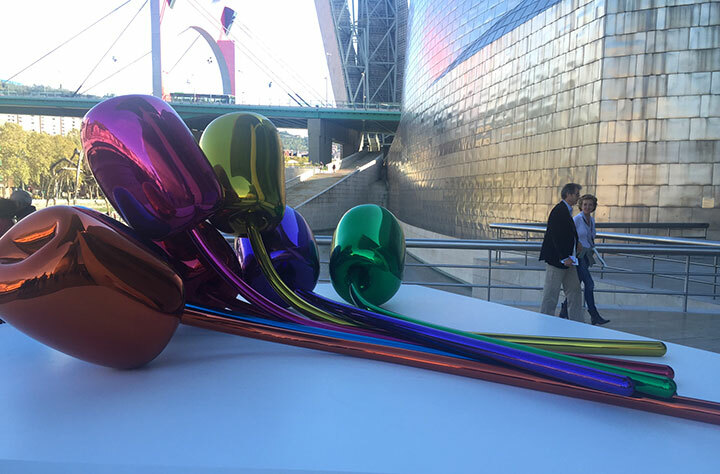 Then I was surprised about the city of Bilbao. I imagined it was a little hole-in-the-wall community, but it’s not! It’s a fairly large city, clean, with impressive buildings, squares, restaurants, etc. 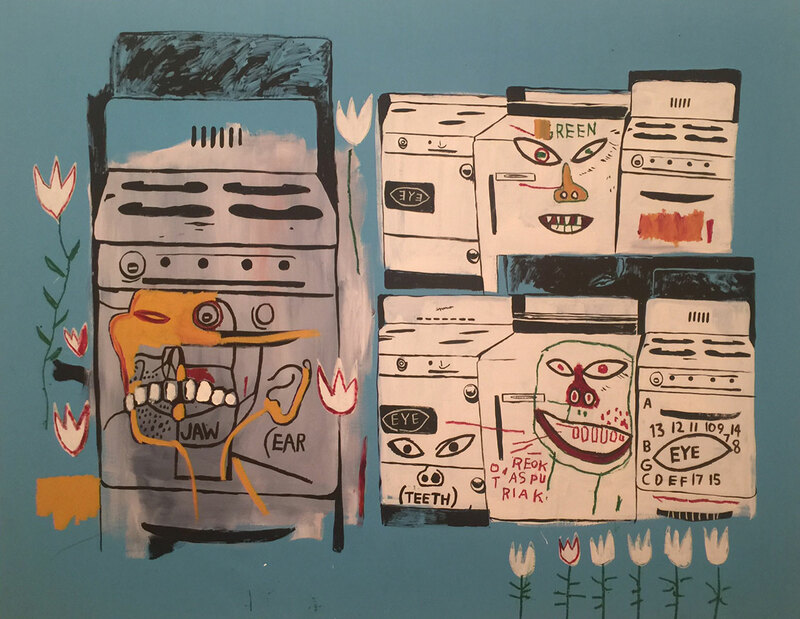 The museum specializes in modern art and currently has an extensive Basquiat exhibition. Call me ignorant, but I don’t get it. Basquiat paintings are highly sought after and bring millions at auction, but I think if Monet were alive today, he wouldn’t get it either. When I look at art that I could have done myself, it’s not art. It seems Basquiat was blessed by the powers that be and then could do no wrong. If he had thrown dirt at a canvas and put a stripe on it, someone would have interpreted it as brilliant and revolutionary. Looks to me like an example of The Emperor’s New Clothes. 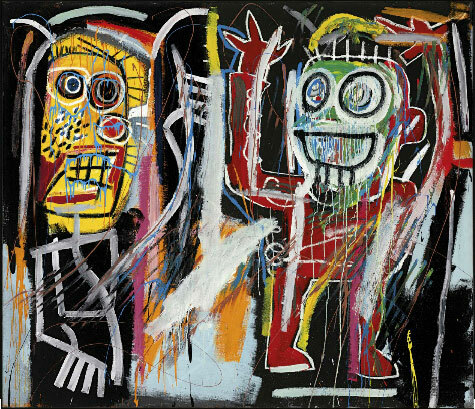 Christie’s recently sold a Basquiat, Dustheads for $48,843,750. OK, I admit I couldn’t have painted that one. 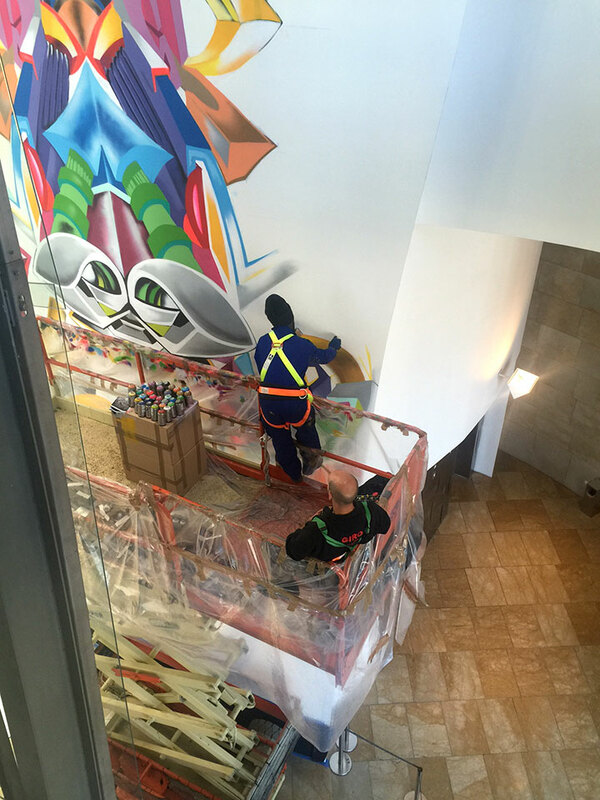 It was very interesting watching a Senegalese spray can artist decorating one of the main columns of the interior. He had hundreds of cans of spray paint available. I wonder if this will be a permanent exhibition. 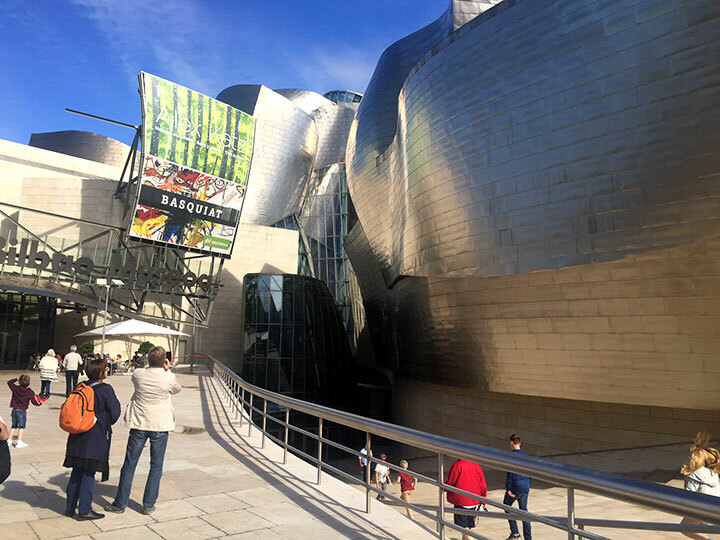 We spent the day at the museum, but it would have been fun to stay longer in Bilbao and experience the city. Maybe another day. 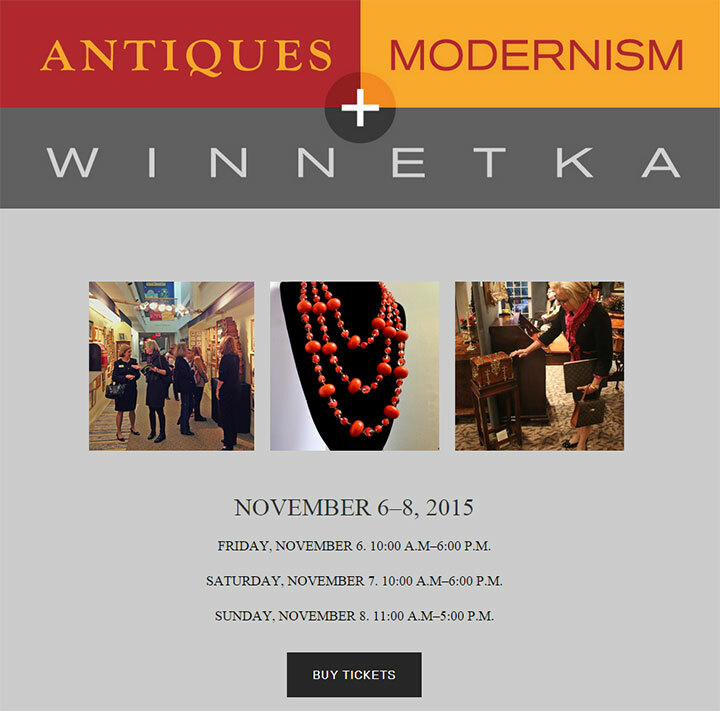 Our next show is coming up soon at the Winnetka Community House in Winnetka, IL, November 6-8, 2015. We used to exhibit at shows in the greater Chicago area 4-6 times yearly. Most of them have disappeared, so we now only exhibit in Chicago twice a year, once in the fall in Winnetka and once in the spring in Glencoe at the Chicago Botanic Gardens. Too bad, because we like Chicago and have lots of friends and clients. We’re really looking forward to seeing you at the show, so please put the dates in your calendar. First I have to apologize if you’ve been having problems with my blog or website. We migrated both to a new provider, so they were both down for a while during the transition. Everything should be fine now. We were in Paris shopping for some great new items and had a much harder time than usual. Unfortunately many of the merchants we dealt with have died or retired, leaving only a few, with not a lot new to offer. We did manage to buy a few great items and we still have a couple of shopping days left, so we’re hopeful. 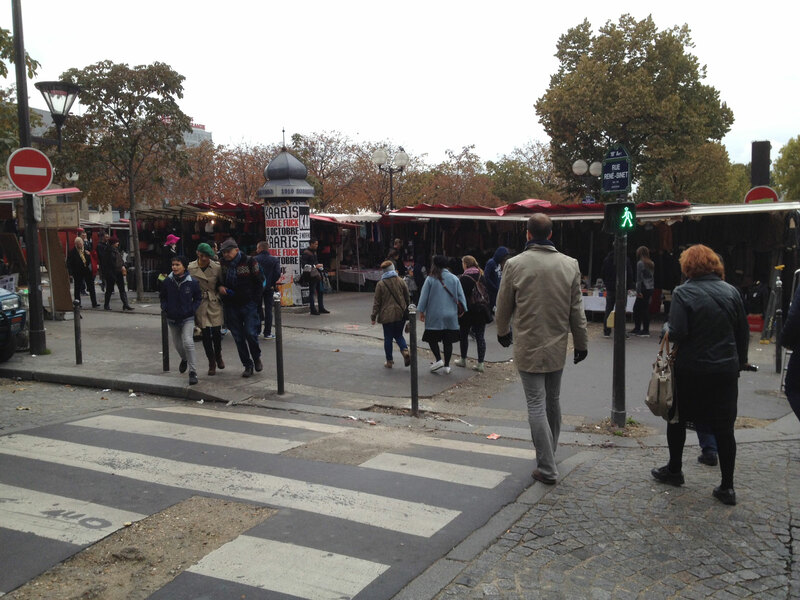 If you want to visit the Paris flea markets, take the Metro #4 train north to the last stop, Porte de Clignancourt. From there, keep walking north (head toward the overhead roadway called the Péripherique). First you’ll come to the standard flea market on your left, with clothing, souvenirs and all the usual stuff you’d expect to see. 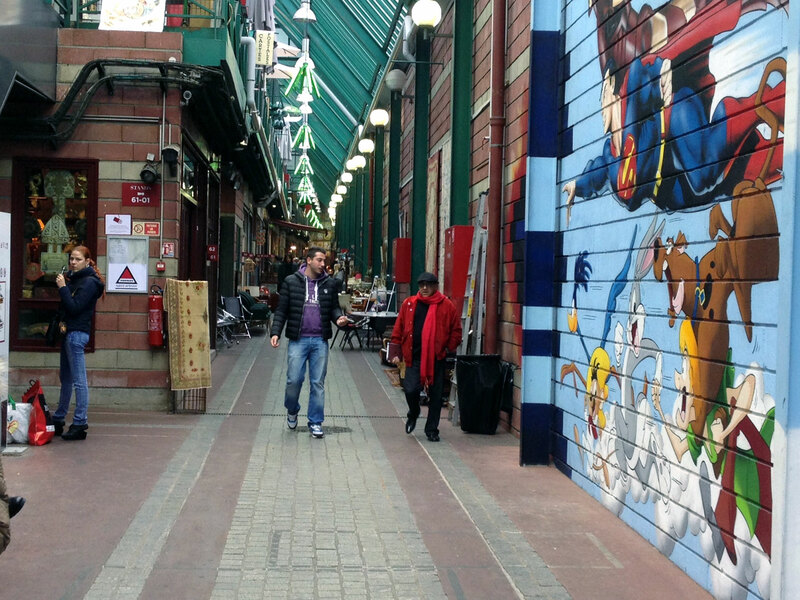 Continue past the flea market and pass under the Péripherique. Walk one more block to rue des Rosiers and make a left. Technically, you’ve just left Paris and you’re in the suburb of St. Ouen (pronounced similarly to San Juan). You’re now at the start of many flea markets. 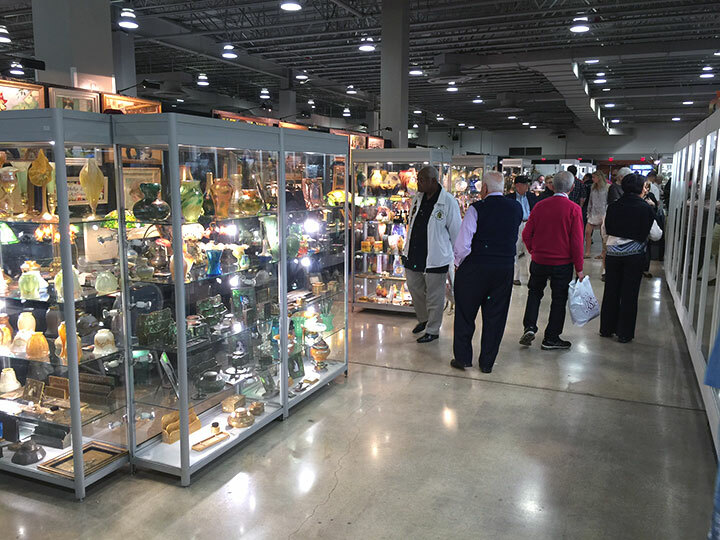 There are so many markets and so many dealers, you’ll run out of time before you see them all. 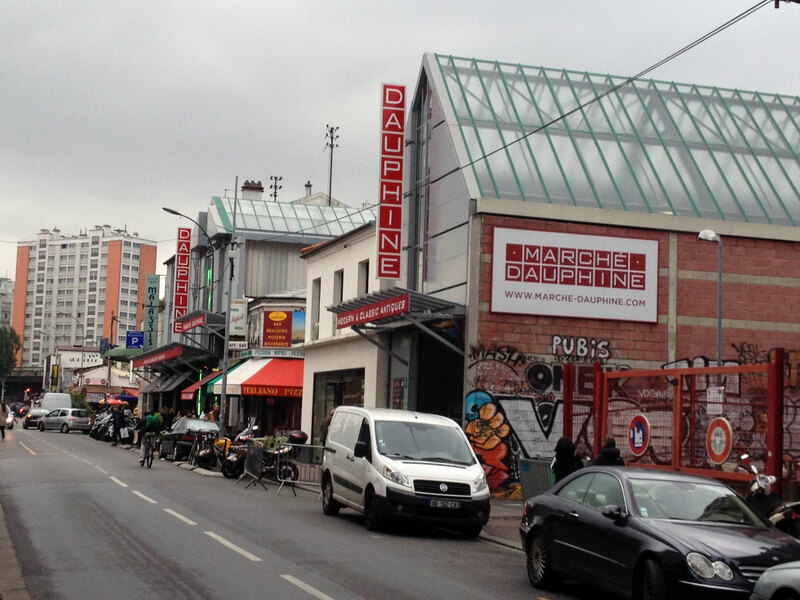 The first market you’ll pass on the left is called Marché Malassis. (Don’t get confused by the photo. It’s looking east and you’ll be walking west.) Then Marché Dauphine, Marché Vernaison, Marché Biron, Marché Paul Bert and Marché Serpette. And I’ve probably missed a couple. 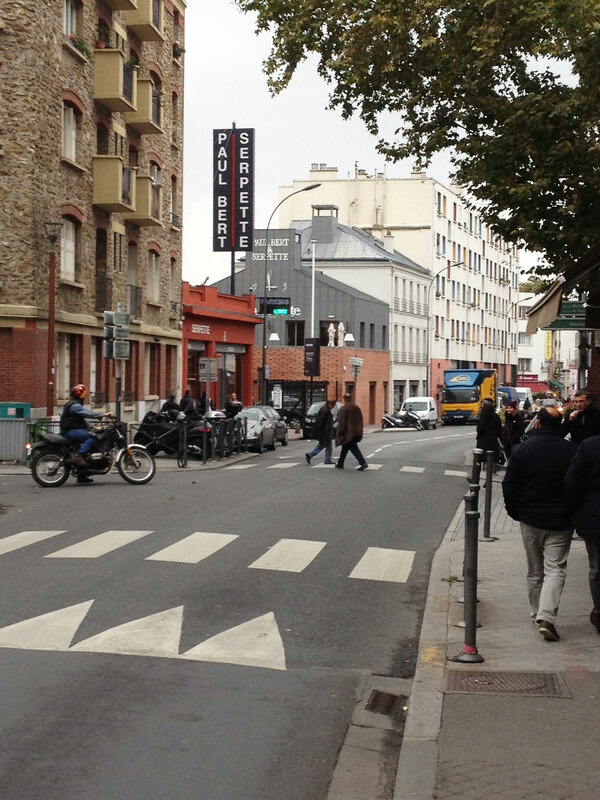 If you turn left at the corner before Marché Paul Bert, there’s more. 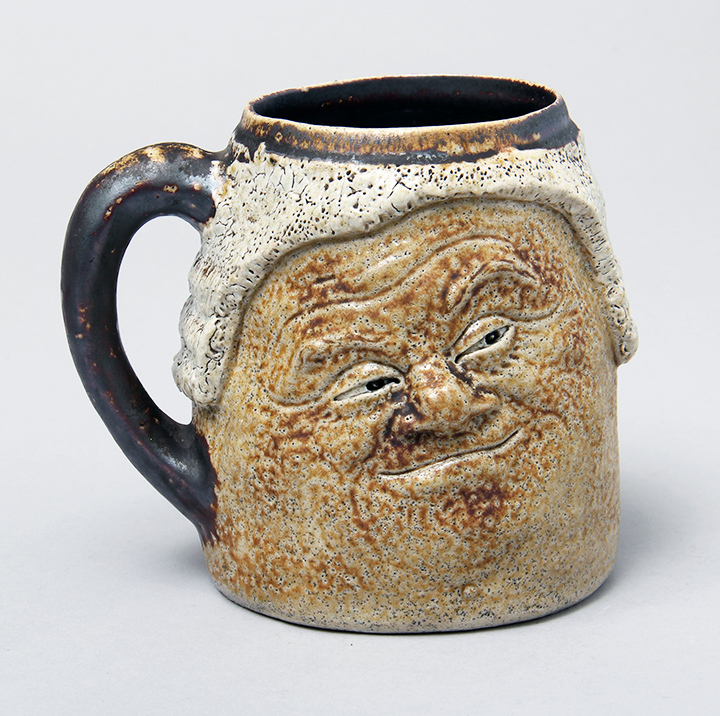 The quality goes from junk to wonderful, with commensurate prices. I’ve noticed many changes over the years. The most obvious was the change in styles. Many of the dealers were carrying more modern items than before, from the ’50s to the present. 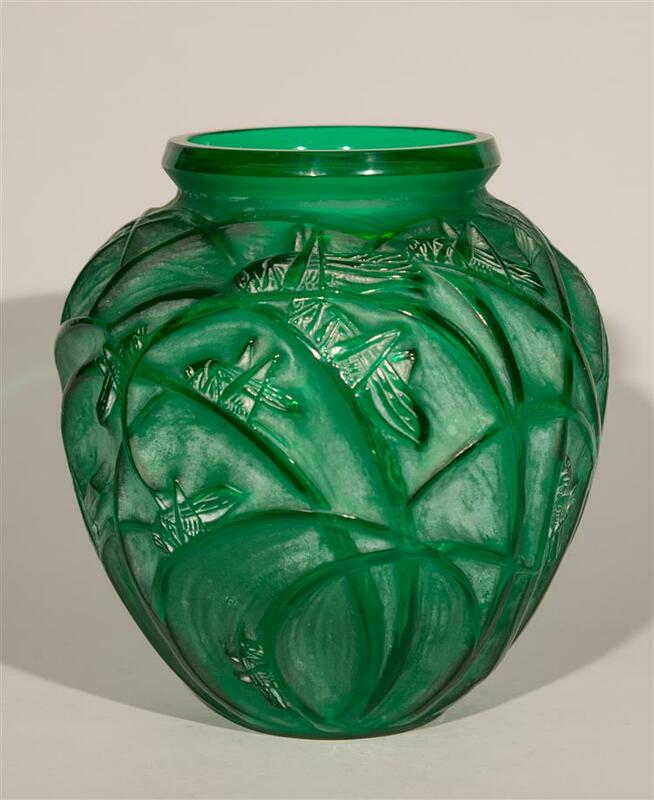 And quality Art Nouveau glass was getting a lot harder to find. Marché Paul Bert and Marché Serpette are adjacent, but Paul Bert is inside and Serpette is outside. Shippers are available right there in the markets, so you can buy anything, no matter the size, as long as you’re willing to pay. If you like flea markets, you’ll have a great time. No matter what your taste, there will be something for you. The markets are open every weekend, with a few dealers open on Mondays. Sorry for the problems with the website and blog. The site was down for a while for maintenance. 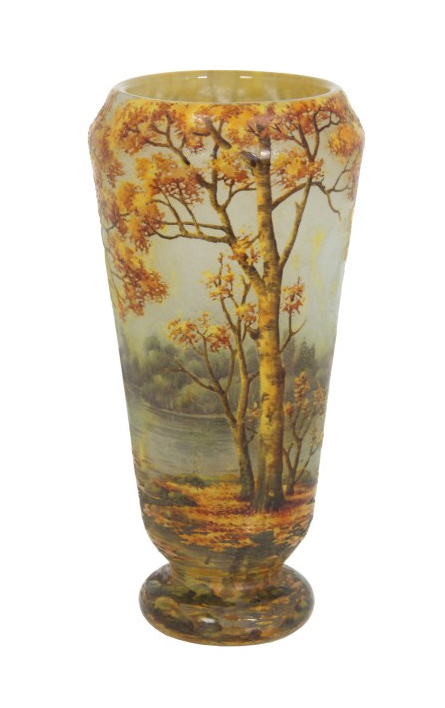 Philip Weiss Auctions, Lynbrook, NY, held a sale entitled Estate Sale, Paintings, Porcelain, Jewelry on Thursday, October 8, 2015. Included in the sale were several very good lots that I tried unsuccessfully to buy. Prices were beyond what a dealer could pay. 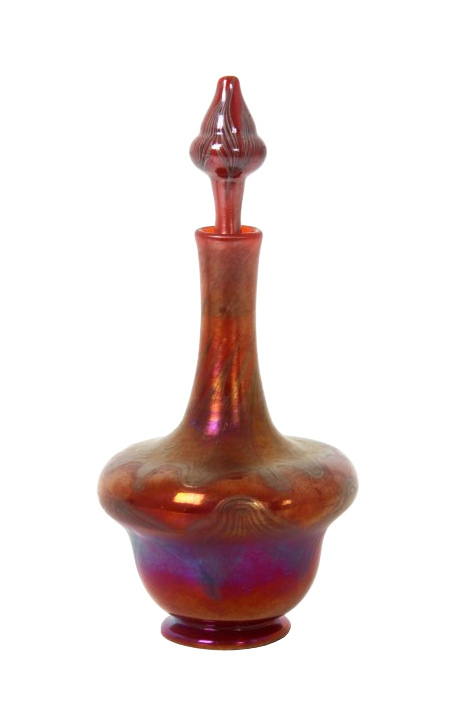 Lot #214 was a killer Daum vase that I really wanted. 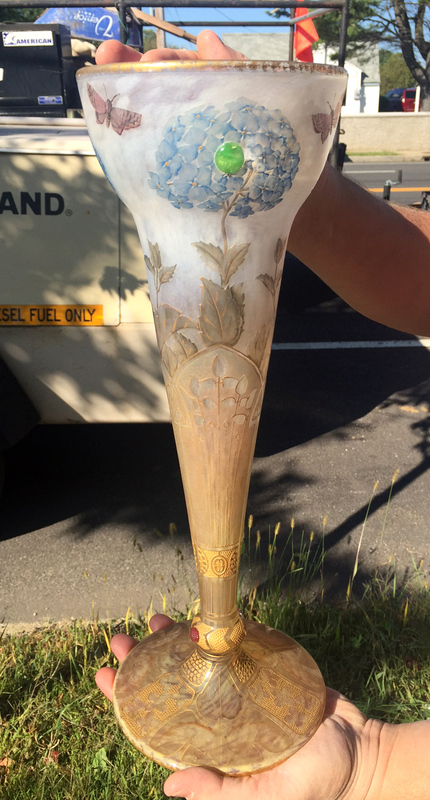 It had everything going for it including butterflies, blue hydrangea flowers, applied cabochons and gilding, plus a nice big size at 15½”. I thought the estimate was a little strong at $12,000 – 16,000, but I was still interested. It finally sold for $20,700, including buyer’s premium. I was the underbidder. Oh well, better luck next time. 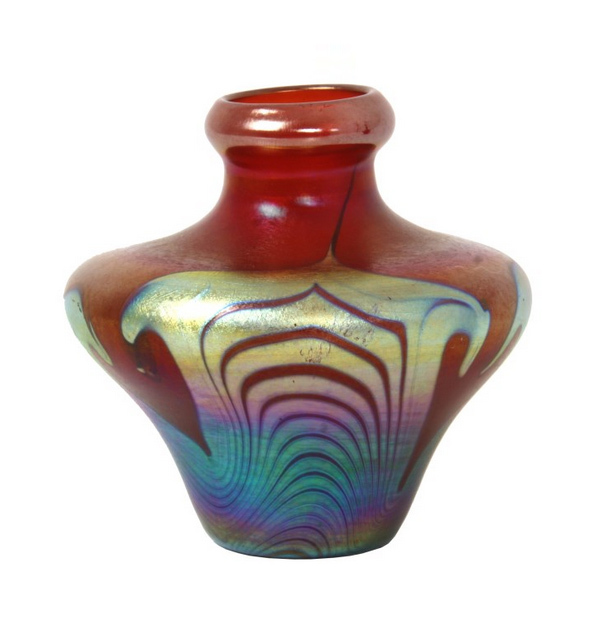 Weiss didn’t think much of lot #534, a Tiffany Studios mosaic inkwell, so he put an estimate of $800 – $1,200. That was really low. The buying public knew better and bid it to $11,212.50, including buyer’s premium, when I had to drop out. It wasn’t even the best example I’d ever seen. 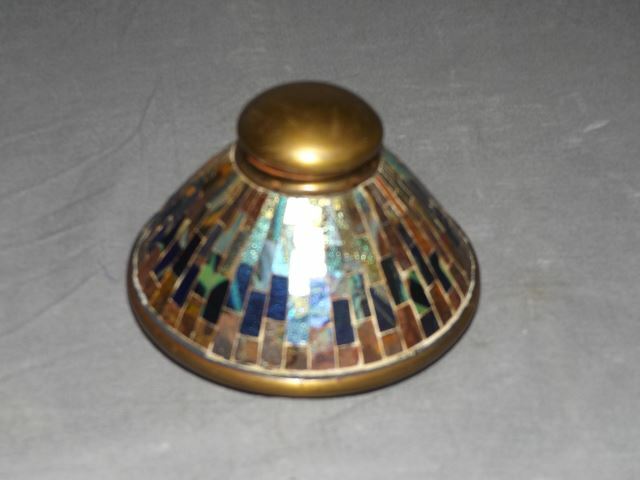 It had a couple of small chips to the mosaic tiles, plus the patina was gone, and it was only signed on the insert. But guess what? Water under the bridge — the public has spoken. We’re off to Europe on a two-week buying trip, so I’ll do my best to post twice a week, but it may not be possible. I’m sure we’ll bring back a few great items for our upcoming shows. Is a Painting Bought for $800 a Rembrandt? Last week U.S. Antique Shows emailed two show announcements. The first one canceled the March 2016 NYC Pier Show. The second canceled the January 2016 Miami Airport Show. I wasn’t too concerned about the March Pier Show because it was fading fast, but I certainly was concerned about the January Miami Airport Show. Last year was fabulous for me, so the cancellation put a big hole in my schedule (and budget). Enter stage right, Rosemary Krieger to the rescue. 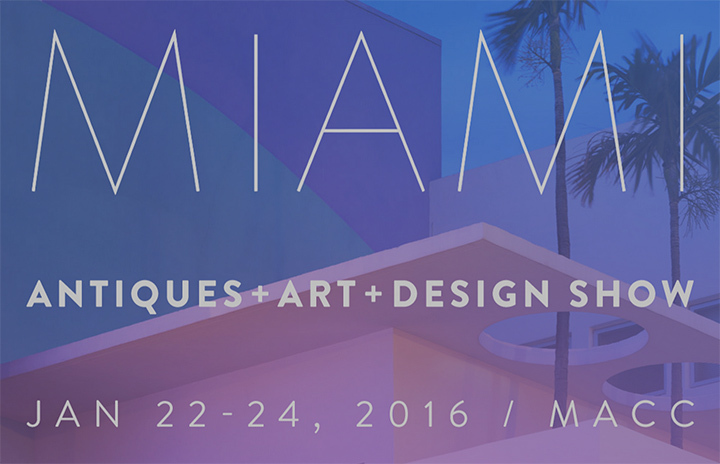 Rosemary’s company, Dolphin Promotions, the former owners of the Miami Airport Show, were creating a new show, the Miami Antiques + Art + Design Show, to take the place of the canceled show. Whoop de doo! The stipulation was they needed at least 100 dealers to sign up or there wouldn’t be a show. Initial interest has been very good, so Rosemary sent me an email confirming that the show will go on. Yahoo! Dealer participation is the key, so I need all of you dealers reading this blog to sign up for the show. You can contact Rosemary by email at rosemary@dolphinfairs.com or by phone at 708.366.2710. Click here for the landing page of the new show. Last year was significantly better than previous years, so let’s make this happen. Sign up and support the show! !